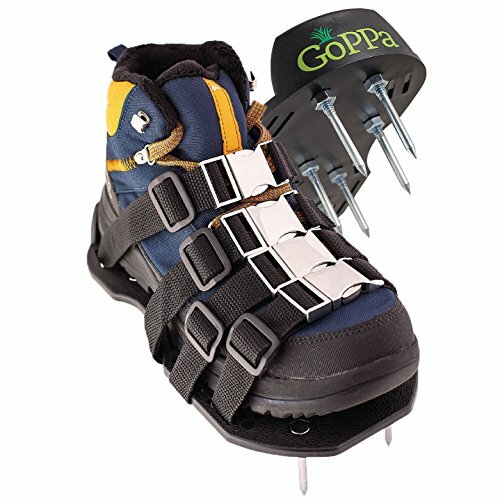 High-end LAWN AERATOR SHOES - GoPPa Strong secret is the unique and innovative strap system designed to FIT ONLY ONCE on your gardening shoes. You can now aerate your yard as a pro. FULLY ASSEMBLED aerator Sandal - SAVE 40 minutes with this ready to use straight from the box lawn aerator shoes. FUN & EASY TO USE - With the proper adjustment, this ONE SIZE FITS ALL aerators can be used even if you're 6.5+ shoe. Fit the straps following the "HOW TO USE VIDEO" and the "USER MANUAL"